This Wrox Blox is a value-packed resource to help experienced .NET developers learn the new .NET release. 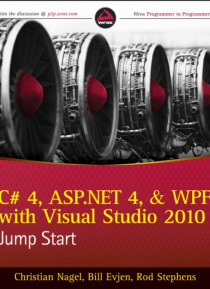 It is excerpted from the Wrox books: Professional C# 4 and .NET 4, Professional ASP.NET 4, and WPF Programmer s Reference by Christian Nagel, Bill Evjen, Scott Hanselman, and Rod Stephens, and includes more than 100 print book pages drawn from these three key titles. It is an excellent resourc… e to help .NET developers get up to speed fast on .NET 4, C# 4.0, ASP.NET 4, and WPF, providing all the information needed to program with the important new features, including: C# Dynamic Types and Parallel Tasks; ASP.NET Ajax, Chart Controls, MVC, and Object Caching; and key WPF principles as developers move from WinForms to WPF. In addition, it provides examples built with the native Visual Studio 2010 tools that developers are comfortable with.